One week to go and I have my fingers crossed. I think things have improved enough to at least try. I was told that around 6-21 there were two water crossings to worry about. One of about 100 yards of knee deep water and one about 50 yards of shin deep water. Dangerous solo water crossings are what I worry about the most. I hope and assume that those are reduced by now. I see that Glen Aulin HSC will open no earlier than 7-9. Assuming that it does open then, how good must the trail conditions be for that to happen? Do they wait until the water crossings are minimal or ?? My brother in law will be hiking up from White Wolf. Does anyone have any updated info on that route? A stream as wide as a football field is long? That doesn't sound right. Are you sure? about 50 yds of shin deep water. That's about it." I assume that the stream had overflowed it's banks and there was standing water for most of the 100 yds. Thanks everyone for all the advice. This website rocks! One week to go and I have my fingers crossed. I think things have improved enough to at least try. I was told that around 6-21 there were two water crossings to worry about. One of about 100 yards of knee deep water and one about 50 yards of shin deep water. Dangerous solo water crossings are what I worry about the most. I backpacked with a 68 year old woman, who has hip and foot issues, along the main trail from Tuolumne to Glen Aulin and dayhiked from there to Waterwheel two weeks ago without any major problems. Edited 2 time(s). Last edit at 07/06/2010 04:02AM by szalkowski. I think she passed me on the trail. Edited 1 time(s). Last edit at 07/17/2010 02:30AM by traildad. Edited 1 time(s). Last edit at 07/17/2010 02:32AM by traildad. 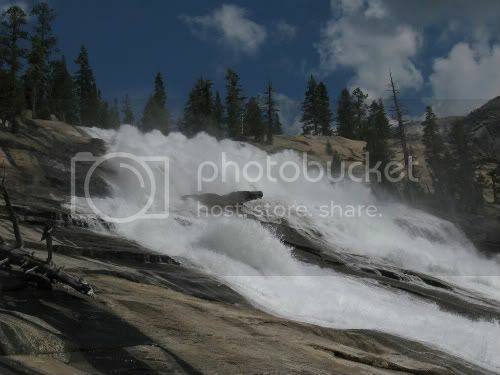 We were just on this trail, going from Glen Aulin to TM, on Friday, July 2. The crossing at the creek in question isn't bad at all. It was a tiny bit higher than ankle deep, so we just took our shoes off and crossed quickly barefoot. We were day hiking, so our packs were light. The backpackers crossing with us had water shoes, and they didn't have any problems. There weren't any other serious water crossings that couldn't be walked through with boots on. Ditto. I went a week and a half ago and the stream crossings weren't bad. Used a big, sturdy log to cross Delaney, but could have just taken our boots off and waded through. Could have done the same with the other crossings, but with the aid of hiking sticks I crossed on partially submerged rocks. Past GA on the way to Waterwheel the trail was submerged (standing water up to 1' deep) for several hundred feet. Again, no problem. We just got back from TM through past GA HSC to Waterwheel falls trip. We made the unfortunate decision to wait for our late arriving friends who drove up the 99 instead of 395. After waiting about 2 hours at the stable parking lot, we finally left - leaving the other part of their family to wait for them. We left about 12:30 and got to our camp just past GA HSC around 5pm. We took our time and enjoyed the views and had a nice "lunch" break next to the river. The stream crossings were a non-issue. The next day we very leisurely took a day hike to Waterwheel Falls. AWESOME! We ran into so many people who would have mistaken California or Le Conte falls for Waterwheel. We ran into several groups who were attempting the whole round trip to Waterwheel in a day. The underwater section was not bad. There was either room next to the mud/water or logs along the trail to keep your feet dry. Oh, we opted to try the 0.5 mile shorter route back on the stable trail. Gee, I think that might have been harder because of the deep sand and the route over a ridge. Not sure if that was worth the supposedly shorter distance. Mosquitos were annoying. We had plenty of DEET spray though. I actually came back with only one annoying bite..... but then I was in long pants and long sleeve, sun screen shirt most of the time. The kids weren't so attentive and got some bites on their faces. It wasn't as cold as I thought it would be at night. It was supposed to have been down to 40 degrees. We slept with our tent fly open. We never used our down jackets. DUH! Could have saved 6+ lbs there. Note to self, "Only bring down jackets if night time temps are near 30 degrees." The water was very cold, but several members of our party did get all the way in. I was actually surprised at how often they had to "wash up." I guess, cleanliness is next to godliness for some. Great trip. Highly recommend it. Next time we will plan for a fall trip so we can swim more and maybe there will be less mosquitos. Oh, on the hike out and the drive home, we could see afternoon thundershowers all through the Sierras. We were lucky. Stopped in Lone Pine at the Mt. Whitney cafe for a late lunch. Man was it hot in town and muggy in the restaurant. Apparently the swamp cooler was not taking the humidity well. The food was good. It was hard to enjoy "the best burgers in town" when it was so muggy inside though. I couldn't wait to get out of there and back into the air conditioning in the car. Edited 1 time(s). Last edit at 07/11/2010 03:33PM by wrecksduke. I had to laugh when I read your reference to saving .5 mile on the Stable trail. I fell for that once also with a full pack. Your are right. That deep grinding sand is not worth it. Then there's poor Tueeulala Fall, which is often mistaken for the smaller, shorter fall to the west of it--it doesn't help that the USGS topo map (and my edition of the Schaffer/Wilderness Press map) is incorrect. Sorry to say, but I'd vote for LeConte. Thanks bill-e-g and qumqats. Yeah, a little disappointing (and embarrassing) but now I can get it corrected. Just have to make another trip back. P.S. Not that either of you care, but I gave credit to you for the correction (on my blog). Edited 3 time(s). Last edit at 07/13/2010 06:06AM by sierranomad. Yeah, I'd vote LeConte too. 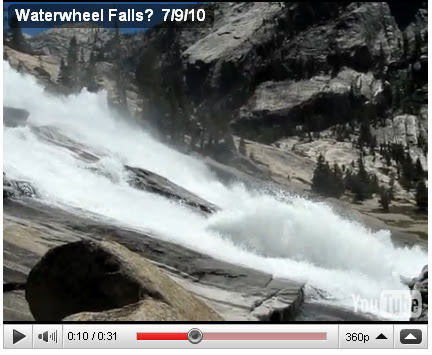 Waterwheels strikes a perpendicular rock and makes an almost 90 degree turn. There are soooo many falls before you get there though! The names have caused confusion since they named them. (heck, I'll admit... it'd been awhile... and it was "where the heck is LeConte!?!?!" says"... How it could still be wrong on so many maps today is beyond me. Didn't make the mistake the second time. This was early May last year. Water at the top of Wapama... 33 degrees. I think Sierra Nomad was at water wheel. I have video I took last weekend. I DON'T KNOW how to get it here though. Advice? OK. Created a youtube account. Also check out this old pic. Where they wrong in 1960 also. Well Bill-e-g should know. I'm crushed. We went with a 76 year old guy who supposedly KNEW the falls. Apparently they were wrong in 1960 as well. I still thought they were impressive. Not sure if its worth going back for ONE waterwheel. So how much further was it to Waterwheel Falls? OK. Clear that we did not get to the ONE, REAL Waterwheel falls. I'm still happy with our BP trip. 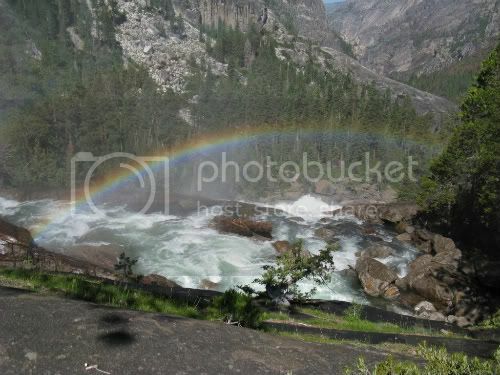 We will eventually hike the whole Grand Canyon of the Tuolumne and THEN we'll see Waterwheel. Thanks for educating us. Le Conte was awesome still. At LeConte the trail goes down right beside the slabs. The slabs are at a shallow enough angle you can walk out there beside the wheels. There's a beautiful picnic spot trailside where most of the LeConte pictures/videos were taken. At the REAL Waterwheel the trail goes AWAY from the falls. The slabs are at a very steep angle that makes it very difficult/dangerous to get close to the wheels. Here's the view from above. If you go all the way to the Return Creek bridge you can be assured you've seen it. I think waterwheel falls is well worth seeing. My son and I did it about six years ago and I'm thinking strongly about doing it again next week when I am in that area. Long day hike though, but doable. Like you I would post pictures and video but I don't know how. Nice google earth image and captions. Just to clarify, Bill-e-g flipped the image 180 degrees correct? WW is "northwest" of Le Conte. Me too. A little disappointed to have not made my goal, but hey, I loved LeConte when I thought it was Waterwheel, so how can I feel too bad? I'll go back (and go to Return Creek Bridge) to be sure I made it. But not this year, there are too many other trails to see...Waterwheel can wait. The first time my wife and I hiked to what we thought was Waterwheel Fall, we stopped where (then) there were two trail signs (at what we now know to be the "major" spur trail to LeConte Fall) with the distance to Glen Aulin and Pate Valley. Since the signs said we were about three miles from GA, which was about the correct distance from there to Waterwheel, we stopped, despite the fact that our newfangled GPS (with hand-entered waypoints!) clearly had us at LeConte. The camp staff at the HSC told us of our mistake when we returned. A few years later, we went all the way to the Return Creek bridge (or rather, where the bridge had been--this was after the Jan '97 flood, so there wasn't much bridge left), but it was late season, so Waterwheel was rather unimpressive, and we still weren't sure what part of the cascade was *the* fabled waterwheel. At least, at this time, there was a sign at the brink of Waterwheel identifying it. 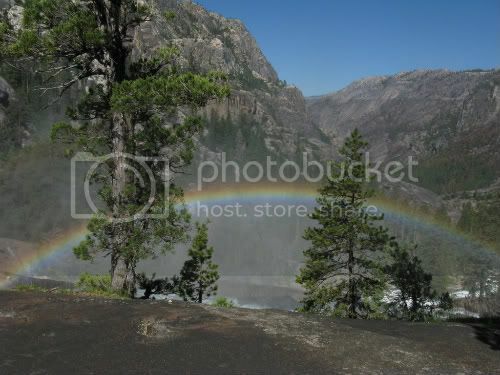 I don't know when the signs were removed/stolen/washed into Hetch Hetchy, but they weren't there in 2008. Maybe missing Waterwheel is some kind of Sierra/Yosemite rite of passage...? Yes you do! I don't know what impresses me more...that you have a picture of anything and everything that comes up, or that you have them organized so that you can pull them up as needed. Just to clarify. bill-e-g are you saying that the video posted by wrecksduke on July 13 is not Waterwheel falls? So... the video is absolutely, without a doubt, LeConte. btw ... basilbop started this... so I'd give him the credit. Thanks bill-e-g. Great shot of Whaterweel with the rainbow! What type of camera equipment do you use? 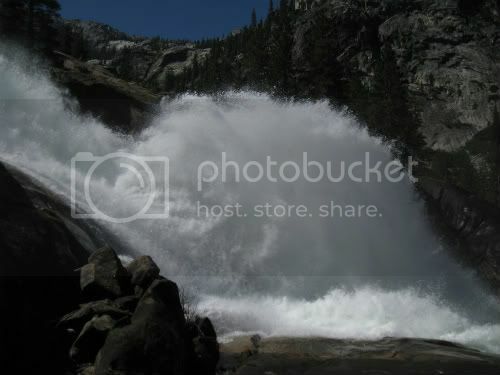 It seems LeConte falls has more of the waterweel features than the actual Waterweel falls. 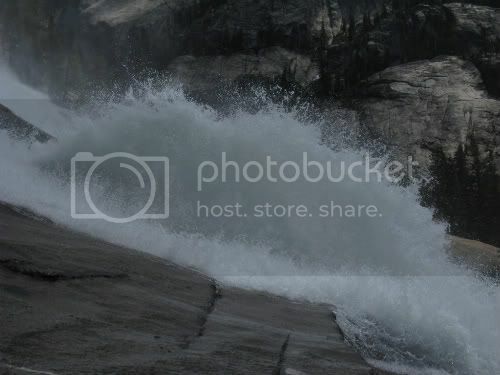 I seem to remember a documentary on Yosemite a few years back and I beleve what they thought was Waterweel was probably LeConte also. I'm starting to think that where I was at 6 years ago was LeConte. Going to have to go back down there next week. I seem to remember a documentary on Yosemite a few years back and I beleve what they thought was Waterweel was probably LeConte also. I saw a California's Gold that was supposed to feature Waterwheel that I think may have been LeConte. I've seen several pictures of "Waterwheel" (actually LeConte), so when I got to LeConte I was certain that it was Waterwheel....it looked exactly as I expected. I wonder how many people that think they saw Waterwheel really did. I wonder about what a lot of people say they did/saw. A guy trying to impress me told me he rode his motorcycle up to Half Dome (it is not a trail bike). I said "no you didn't." He proceeded to argue and say yes he did, and I said, NO, YOU DID NOT. 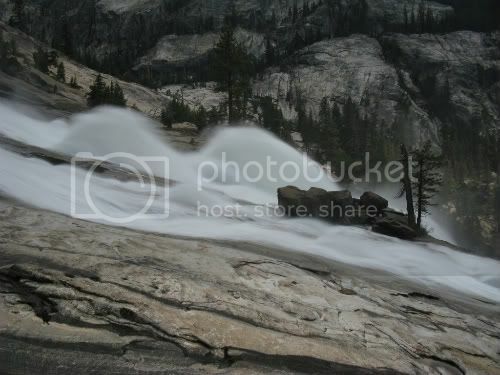 And when he argued some more I asked him did he carry it up the steps on the Mist Trail? 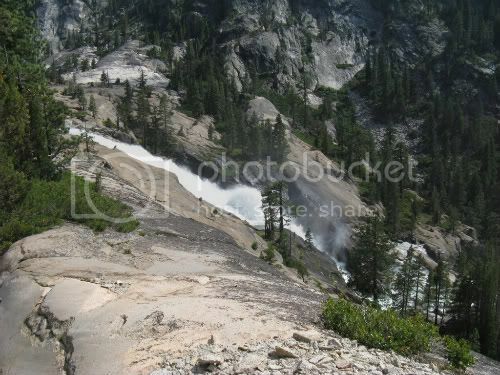 or ride it up the John Muir Trail switchbacks? and if so how much of a fine did you pay when they threw you out of the park? He had no idea what I was talking about, said there was no eight mile trail, it was a road... and I said YOU WENT TO FRESNO DOME. Go drink some more beer and try again with someone who doesn't hike in Yosemite. But can you see Fresno Dome from Turlock? I should have asked! What was I thinking? I'm sure he goes "everywhere" and would have known. Edited 1 time(s). Last edit at 07/15/2010 04:14PM by AlmostThere. Is that a jab at those who have seen Half Dome from Turlock? who think you can't see Half Dome from Turlock. If the Turlock Chamber of Commerce was smart, they would set up a webcam with a high-powered telephoto lens focused on Half Dome, then archive all the webcam photos where the visibility was clear enough to see Half Dome. It would generate positive publicity for their fair city. I'm doing the trip from TM to Glen Aulin and May Lake in a couple of weeks. I've got reservations at Curry Village for the two days prior; should I expect major problems with acclimation? I've been trying to get reservations at TM or White Wolf (or the TM campground), but no-one seems to be canceling. I like the idea of two nights in the Valley to show my buddy around and not need to drive for a day, but I'm really concerned that trying to hike at that altitude with no acclimation will wipe me out (first time backpacker, for all intensive purposes). Any suggestions? It's 8.5-9.5k. Don't worry about it. Edited 1 time(s). Last edit at 07/15/2010 06:26PM by szalkowski. Very roughly, air pressure and air density decrease about 2.2% for each 1k elevation gain above sea level. Therefore, with each breath you will be inhaling about 80% the amount of oxygen that you would at sea level. Go by the date on your permit. You must start hiking on the day you obtained the wilderness permit for - there is a trail quota, you must go on the day you specified. If there is a night prior to your start date for which you do not have reserved accommodations, stay in the TM backpacker campground $5/person - it's for backpackers with valid permits, you can stay the night before and/or the night after your wilderness permit itinerary. If you want to delay the trip a day or start a day early... you'll have to wait in line at TM very early in the morning and attempt to get a walk in permit. I'm not going to delay. Given your responses and that we want to spend some time in Yosemite Valley, I think I'll stick with Curry Village for the couple of days prior. Thanks for the responses. I just got back from my trip today. What a wonderful time. I want to thank everyone that helped me prepare for my trip. The info I have found here was very helpful. Next year I hope to do Half Dome. My brother in law mistook Le Conte for Waterwheel last year. This year we made sure. 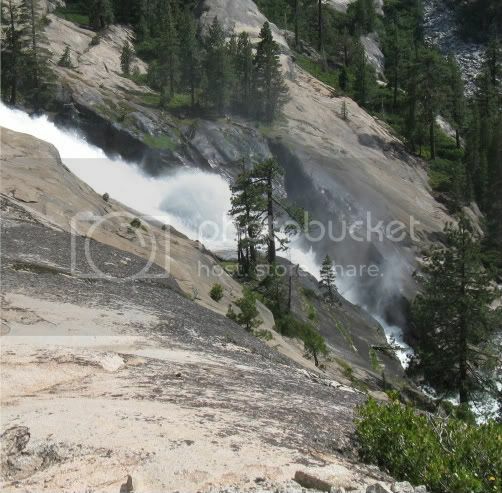 He hiked in from the South fork of the Tuolumne and through Pate Valley, and I hiked down to Return Creek and camped. He met me at Return Creek and we hiked up together. I took tons of photos. I hiked down on the 13th and back up on the 14th. Here are a few photos that might help to show the difference between the two falls. Waterwheel Falls. Notice the steepness before the wheel. Le Conte Falls. Notice the rock in the foreground. Here is a view of the Waterwheel. No rock. Also notice the shape of the wheel at Le Conte is longer than Waterwheel. Just another rainbow for good measure. Yes I worked my way down in front of those two trees to get the closeups. Just to add mine to aid future clarifications after trying to figure for myself the real Waterwheel Falls, and with thanks to the examples in this thread, is a panoramic shot of Le Conte Falls. sierranomad...I saw that California's Gold show and it was confusing, because Huell said he was going to Waterwheel Falls but the trail guide clearly told him that the falls that they rode to was LeConte.